Web surfers love lists—best Twitter apps, best albums, greatest films, world’s richest, best colleges (no, wait, we’re not supposed to like this list). So, I thought I’d serve up a list for my audience. 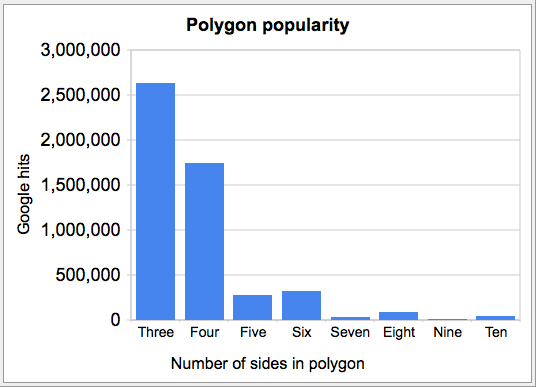 The top 8 most popular polygons. I started thinking about that again. Both of my kids (one of whom is 2 years old) know what an octagon is, but I doubt my college students know the heptagon. So, I decided to google the terms and see which polygons received the most hits. The more hits, the more popular the term. There are a few problems. The first is that some of these words have nongeometric meanings like triangle and pentagon. Second, certain polygons have more than one name (rectangle, quadrilateral, tetragon, quadrangle). To solve the first problem I entered the term geometry before the name of the polygon (for example I searched for geometry pentagon). * To solve the second problem I added the number of search results for each of the terms. Neither of these is a perfect solution, but hey, this is just a blog and not a submission to [name your favorite elite mathematical journal]. So here they are (drum roll, please), the top eight most popular polygons with 10 or fewer sides. Here is a graph to illustrate the relative popularity of the n-gons. One thing I found interesting while searching for information about polygons was their naming conventions. Here is what I found. Apparently there are two naming conventions (one with kai’s and one without). For example, a polygon with 47 sides would be called tetracontakaiheptagon or a tetracontaheptagon (of course, in practice mathematicians usually opt for the more compact and boring 47-gon). From what I can tell it was John Conway and Antreas Hatzipolakis who completed the namings up to the millions. Previous Post Happy square root day! Really? And should college students care about such trivia? Perhaps we need to stop caring about names that don’t add any meaning. Lets just call it a 7-gon and be happy. I agree. Why should a 4th or 5th grader need to know this. Half of the students I teach can’t tell me the difference between a rectangle and a rectangular prism. They have had this taught to them at this school since they were in I know second grade. Mathematicians are trying to push skills down lower and lower, and mentally children are not developmentally ready for this skill. And in fact, a quick google suggests that 7-gon and 9-gon are each more popular then heptagon and nonagon.